What book have you read recently that has surprised you (good or bad! ), or that has been outside your normal reading genre? Hmmm. Well, I'm gonna say Guilty Pleasures (Book #1 in the Anita Blake, Vampire Hunter series) by Laurell K. Hamilton. I was really iffy when I started to collect the books in this series to read, seeing as they've been getting so much rave. I just had to find out for myself who the heck was this Anita Blake & what's so danged special about these books. Well, when I first started reading Guilty Pleasures, I was really let down. It started off really slow for me, but I always try and finish a book and I was determined to at least finish this one before passing judgement. About halfway through the book is when I was surprised! The pace picked up and I was introduced to a few more characters that piqued my interest. What about you? What book have you read recently that has surprised you? 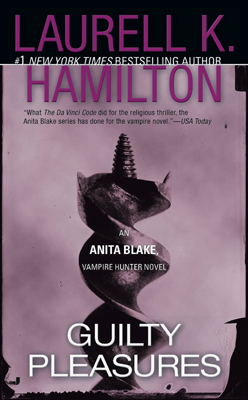 I've never read anynof Hamilton books. Although I have added all of them on my TBR. Lol. So many books..
You're right seriously a lot of books. So far, I like her Merry Gentry series more. But this one might grow on me... might. lol Thanks for stopping by, Angela! This is the one with Philip, right? I still remember him after all of these years. Guilty Pleasures does start out a little slow. I tried to get my husband to read the series years ago and he was bored and gave up. Yepp this is the one with Phillip. I both liked & disliked him. I can't stand a weak man! But, I dealt with it because his character wasn't all that bad. Did you husband stop with Guilty Pleasures? Thanks for stopping by! Yeah, he was more of the sort of men Anita likes to keep as pets :) But I loved him all the same. My husband didn't even finish GP and gave up. He's not a big reader but I was disappointed. Hey Ning, yeah, it was really slow for me in the beginning but picked up a bit... Hopefully the next one isn't as slow or it keeps my interest otherwise it's in my DNF series pile. Thanks for stopping by girly! I tried to read GP a while back, but it didn't hold my interest. Maybe I'll try to pick it up again later. I do remember doing the same thing with The Host by Stephanie Meyer...it was slow as hell and I couldn't connect with it. Later I picked it up, and now I love it. Can't wait to see how they do the movie for it. Maybe you should :) Let me know what you think if you ever pick it back up again! Ahhh I hear you on that one! The Host was just -_____- no words. I think I stopped after the second page. I lost interest right away. I'm not so sure I want to pick it up and try again but maybe the movie will change my mind. who knows >.< Thanks for stopping by! I mentioned this on your book review but it was a slow start for me too, I stopped at book 4 and I'm not eager to get on with it. A lot of people are saying that the series turned a total 360 after the 10th book and I don't want to get invested in a series only to end up hating it. It's like a set up. You're right, it is like a set up. I try and at least give the first two books a go, after that I make up my mind whether or not to continue. Thanks for stopping by, Braine! I have Hamilton on my TBR as it has being highly recommended to my. I hope to like them. Hey, Minnie! I def recommend her Meredith Gentry series :) This series is starting of a bit slow for me, but we'll see how I fare with the next book. Yeah, that's how I am. I like to stick to what I know & what I like. Thanks for stopping by! I love the Anita Blake series! I've read this one 3 times now and every time I read it I like it more and more. +New GFC follower!! Wow, really? That's great! Hopefully I like this series just as much. Thanks for the follow & for stopping by!